With moving to the Netherlands for two months, being sick, and then coming back home, I haven't written a studio update for a long time. I recently sat down and listed some of the things I've created these last four months and came up with a long list. Here are a few highlights. 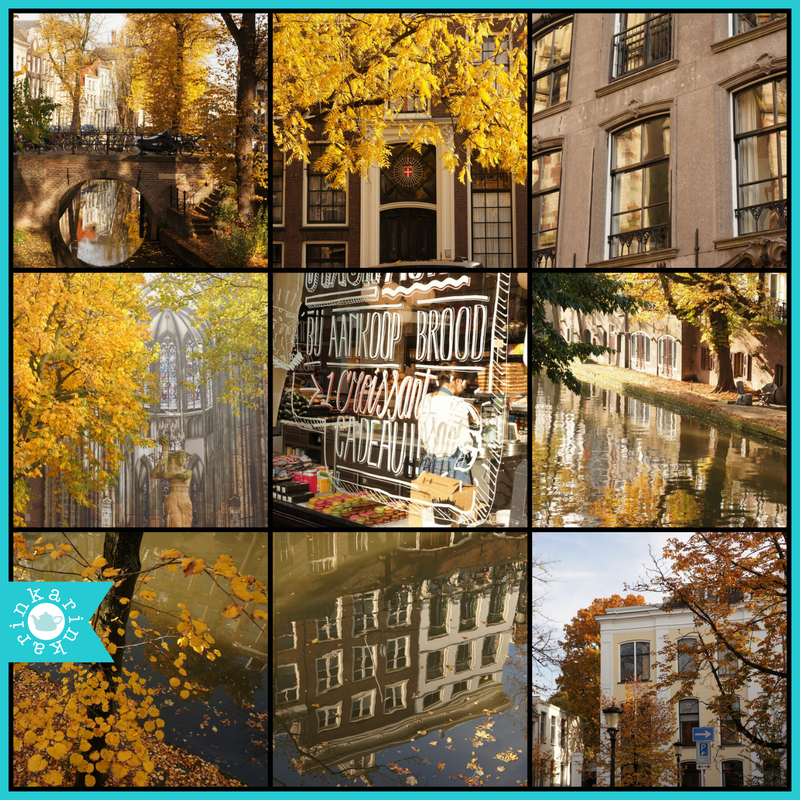 We had a wonderful two months living in Utrecht. Here are a few pictures from the neighbourhood where we lived, which was right in the centre of the city. 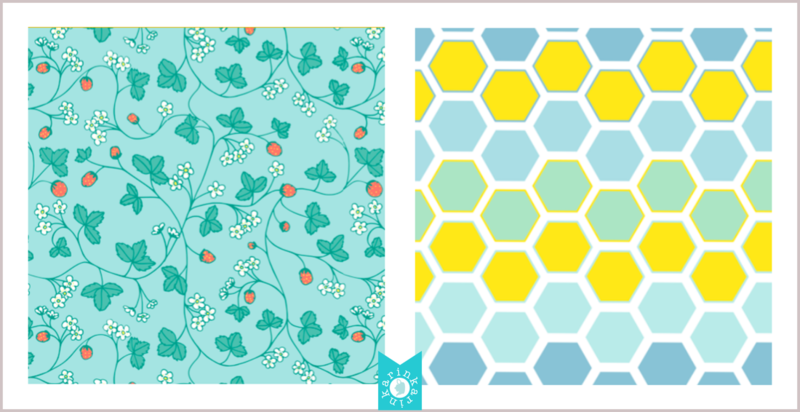 While I was there I finalised some fabric designs and ordered a sampler of 30 swatches of new designs that I've since been steadily reworking, checking and putting up for sale in my spoonflower shop. I always love playing with fabric swatches, combining different colours, finding fabrics that match etc. Here are few of the new fabrics. We lived in a beautiful old flat in Utrecht and I took advantage of the big rooms with minimal stuff to create some mock-up images. 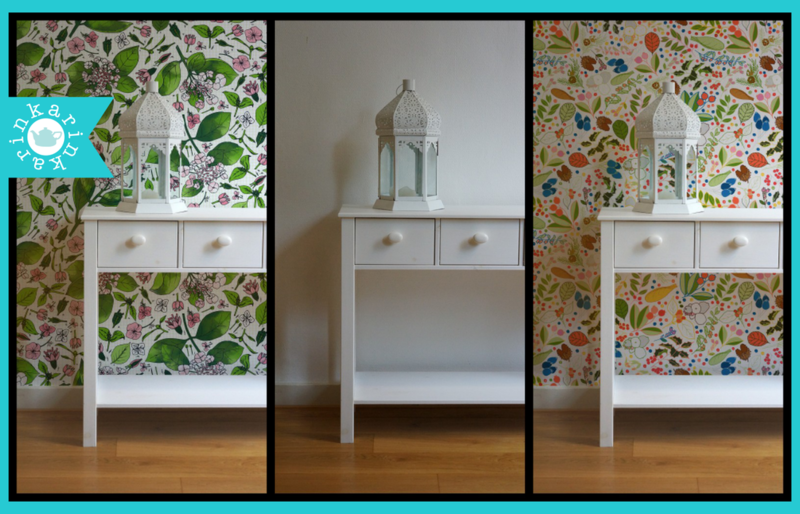 The photo in the middle is the original photo I took, and the left and right images show how some of my wallpaper designs would look. (the left is hortensia botanical study, and the right is light foliage, both available as wallpaper). I'm planning to write a tutorial on my blog soon about how to create mock-ups like this. Another thing I worked on in Utrecht was sewing this little fabric book. 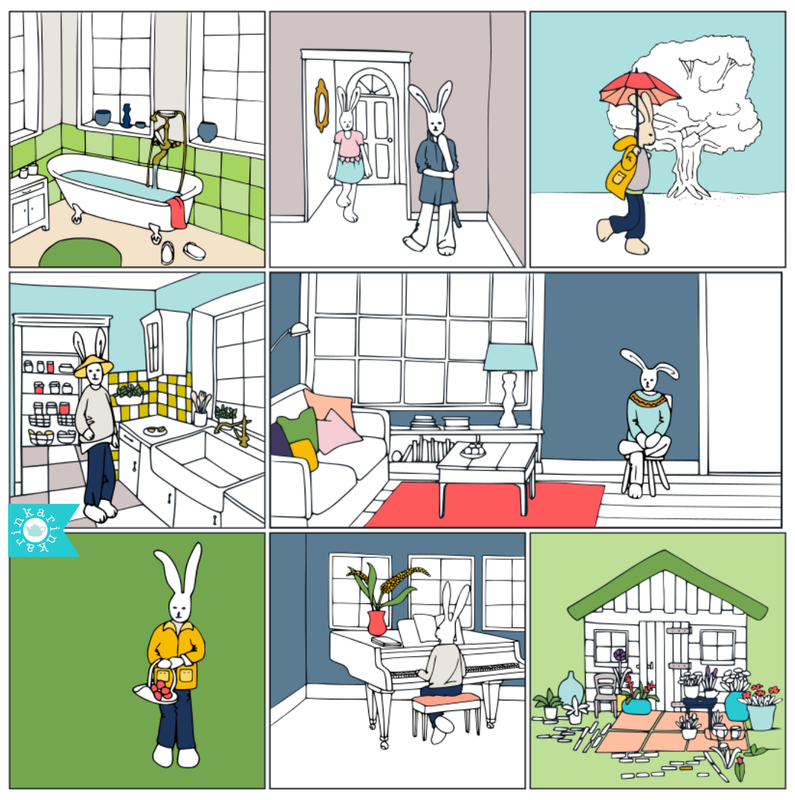 Remember the bunny illustrations I shared here a few months ago? I created a little folding accordion book. The pictures tell a story about my daughter's favourite stuffed animal. I took detailed photos of the process and have a tutorial planned. 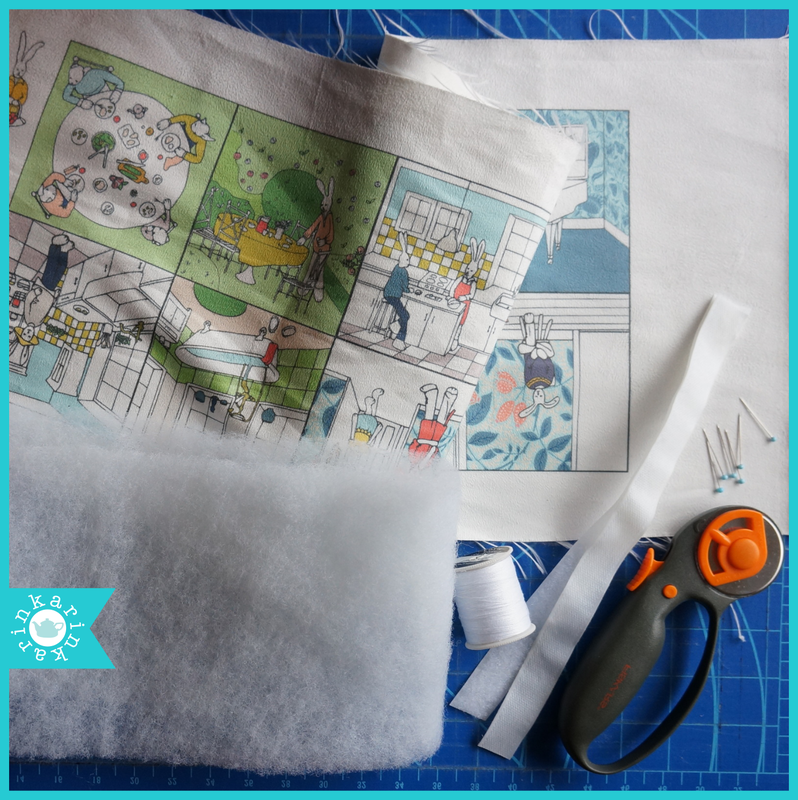 For now, here's a sneak peek at the sewing process. A few months ago I took the makelight taster course by Emily Quinton. 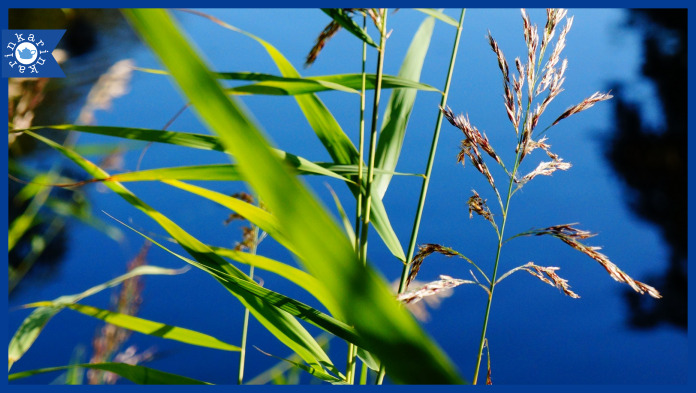 For five days you receive videos and lessons to help create better images for instagram. I love Emily's style (here is her beautiful instagram account) and have gotten a lot of inspiration from her course and her weekly newsletter. I've started integrating some of the tips in my own instagram pictures. I use instagram to share things I make and also as a way to showcase my fabric designs. 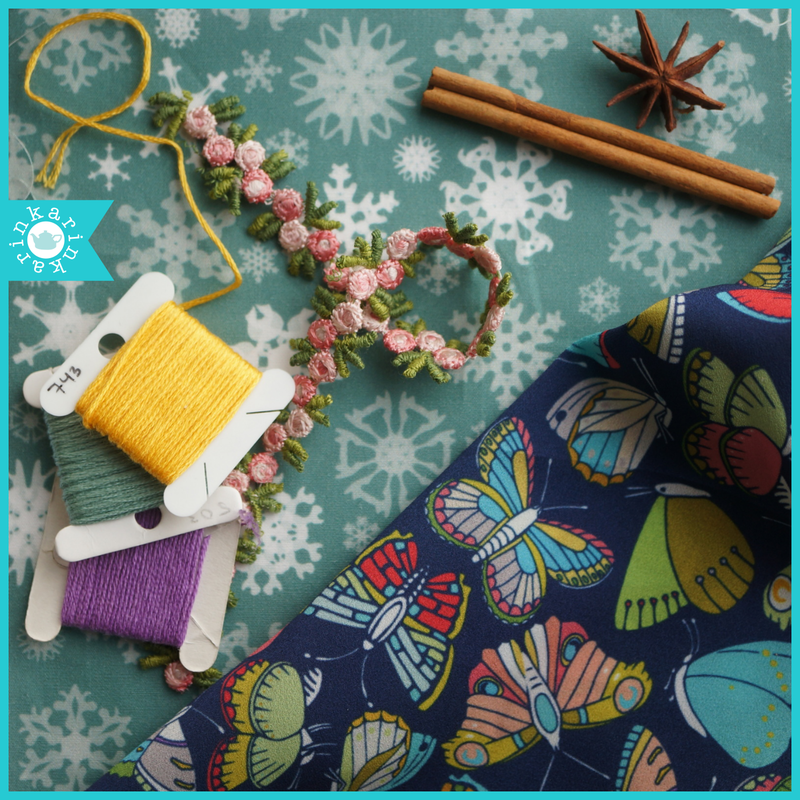 I especially enjoy styling the fabrics with little objects I find around the house to create a more interesting image. Its fun to look for pretty objects that work well with a particular fabric as well as being a way to combine different fabrics and tell a visual story about the designs. You can follow me on instagram here, I'd love to connect! Recently I've rediscovered watercolour paints. I got a few new paints at Christmas, and have loved experimenting with them. This past week I've started creating paintings using some of my existing designs. 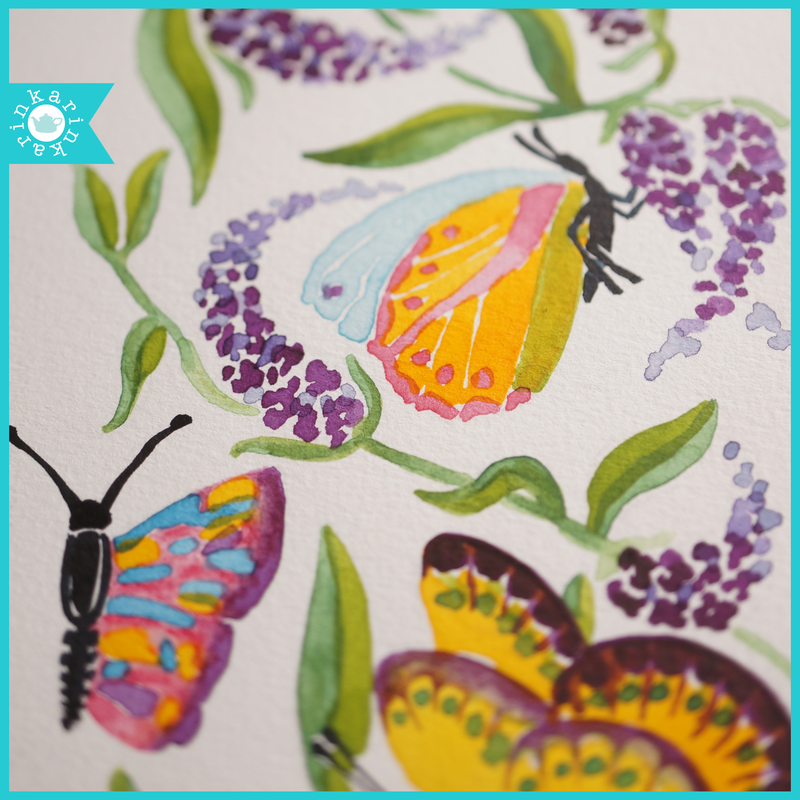 You might recognise the butterflies on this painting from my butterflies collection (this one is from butterflies at noon). Last week I printed out black and white pictures of the repeating element in three of my designs, and I've been working my way through these, painting the elements of the design, playing with colour and learning a lot about watercolour in the process. Its fascinating how you often only understand something by actually trying it. I've been reading a book about properties of watercolour, and only after doing a few paintings myself did the information about transparent and opaque colours, mixing properties of different colours etc. really sink in to my brain. I may have theoretically known that there are warm and cool yellows, but it only made sense after I started mixing the paints, creating different greens with different yellows. This also opened my eyes about why some yellows work better than others in my existing designs. Sometimes its harder to see something on a computer screen than if you physically mix the colours yourself. I love the medium of watercolour and am excited about creating more finished designs using watercolour. I've been posting updates about the process on instagram, if you're interested. Some more things I wrote on my list which I haven't touched on here include sewing projects (another sofa reupholstery project, a doll dress tutorial on my blog), some crochet, a custom-designed shower curtain for a client, and lots of new fabric designs. I hope to include some of these in further studio updates, which should be more regular from now on! This past week has been very full with new things, first a week of holiday in Zeeland, and then on Friday, a move to Utrecht, where we will be living the next two months. The week at the beach was wonderful, we had the most amazing weather. I spent time working on a new design, it was nice to work without a computer, figuring out the repeat for the design by cutting and taping the paper together. I can't wait to digitalise this design and add colour! I did a bit of embroidery, I've been working on this for ages and ages, and didn't get much further, but a few stitches here and there hopefully make a difference. Mostly I just took lots of photos. The light was beautiful. This coming week I'll be settling in, exploring Utrecht, and getting back to some designing. 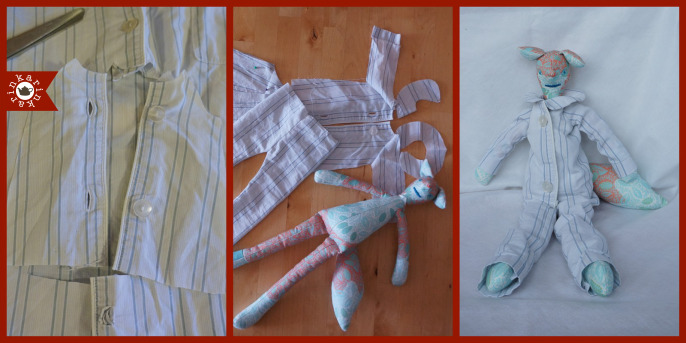 I woke up really early one morning this week, and rather than go back to sleep, I started thinking about drafting small pyjamas from an old pair I was going to throw away. I got up and sewed these. They fit the stuffed fox I have for sale in my shop as a cut and sew pattern. The pyjamas were quite easy to make, because I reused the buttons and hems and only had to make minor adjustments to the trench coat pattern I drafted for the fox a few months ago. I love how once you have a basic sloper pattern for a doll or stuffed animal you can design all kinds of clothes. This week has been all about packing, we are flying tomorrow and will be living in Utrecht for two months! I'm very excited, and have been spending some (quite a bit?!) of my packing time getting different projects ready for taking along. I'll take my sketchbook and pens and can do fabric design from my computer, but I also wanted some sewing and knitting projects. 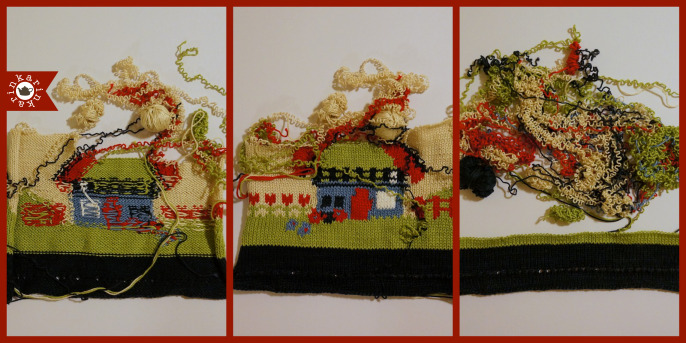 On my blog this week I wrote about frogging this knitting project. I found a new pattern for the front I like more (I liked the windmill a lot, which was one reason I had the sweater sitting half finished for almost two years, but it just wasn't working) and got everything ready and wrapped up to take along. I also wanted to take along some felt. Last year I made some felt ornaments and have the pattern for the wreath ornament for sale on craftsy. 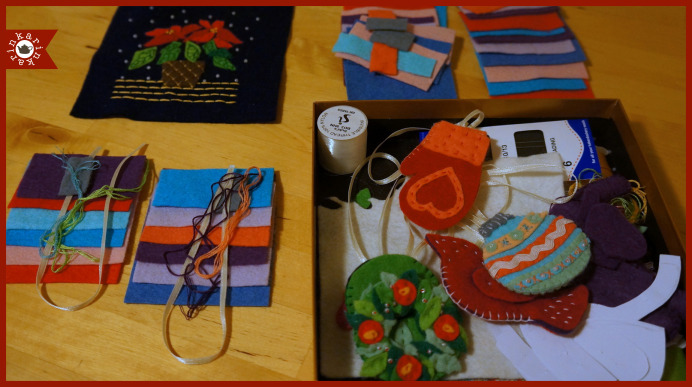 I've been thinking though of making little kits, since I have so much felt left over, and am also thinking of designing some more. I also took a few more of these berry and leaves photos. This time I experimented with incorporating sketches. I'd like to develop this into a fabric design with a mix of photography and drawing. We'll see! 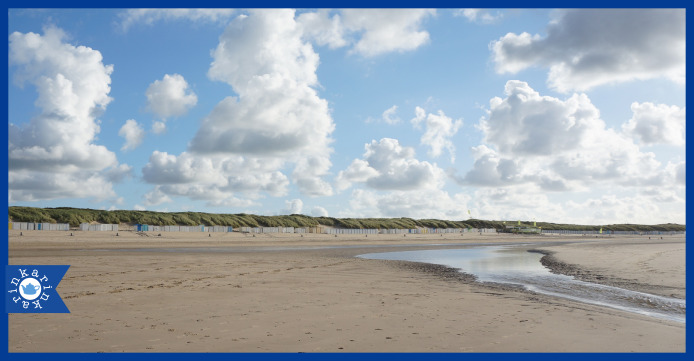 Next week we'll be on holiday by the sea before moving into our flat in Utrecht. I'm so curious how it will be. Its been nice to wrap up some things this week and also prepare some projects while having the feeling of new possibilities and ideas just around the corner. This morning in the post I got a fabric swatch of the newest fabric spoonflower offers. 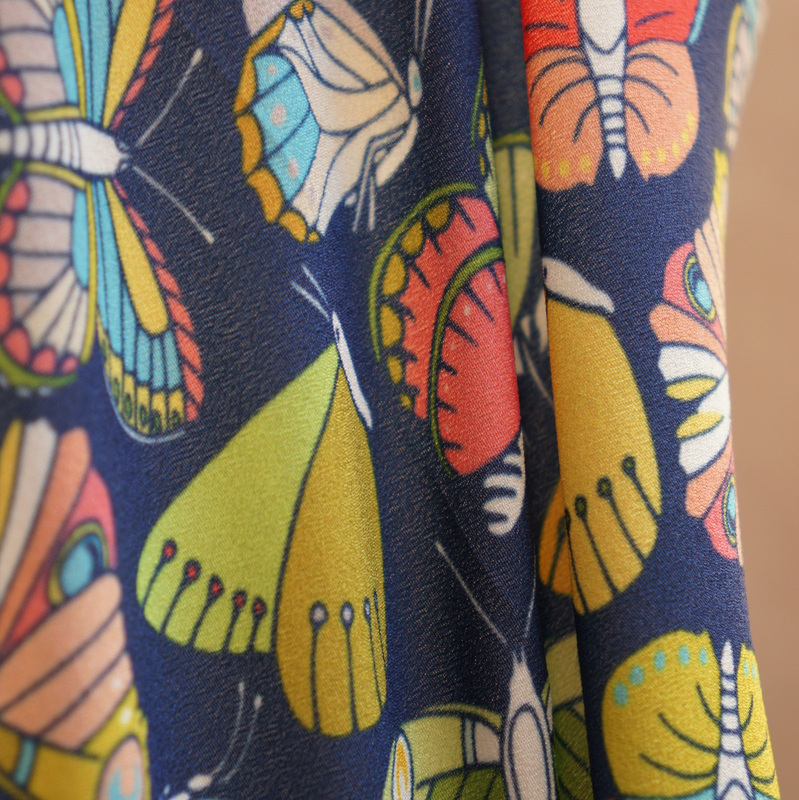 All the designs in my shop are now also available on poly crepe de chine, and I was eager to see what the new fabric would look and feel like. I'm very impressed. I shared a fabric shot in my studio update this morning. Here are few more photos and details about the fabric. The fabric is lightweight, but feels sturdy at the same time. It has a lovely drape. Just holding the fabric swatch makes me want to turn it into a shawl and wrap it around my shoulders! In the photos above you can see how the light shines through the fabric, and how it looks when slightly stretched. 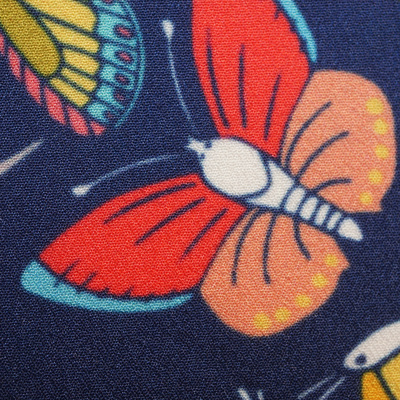 The close-up photo of the butterfly shows the structure of the fabric and detail of the printing (the butterfly is about 1 inch wide). Since this is a polyester fabric it has excellent colourfastness and won't fade. 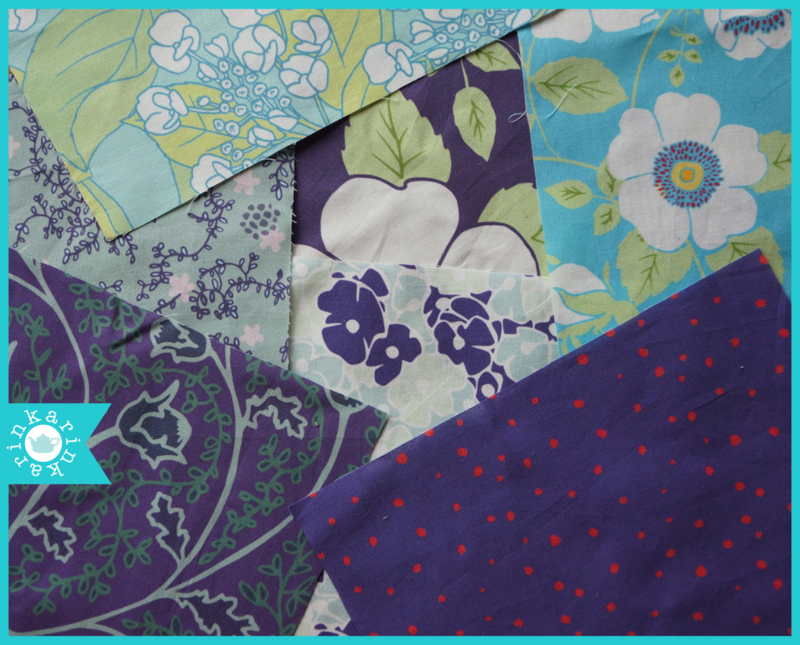 One yard costs $23, and its 52"/132cm wide, so wider than some of the other fabric types available on spoonflower. 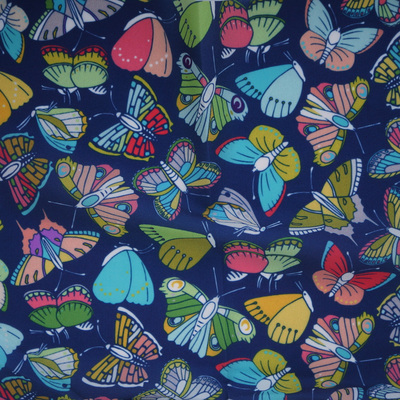 My butterflies at night fabric shown above is now available for sale in my shop! 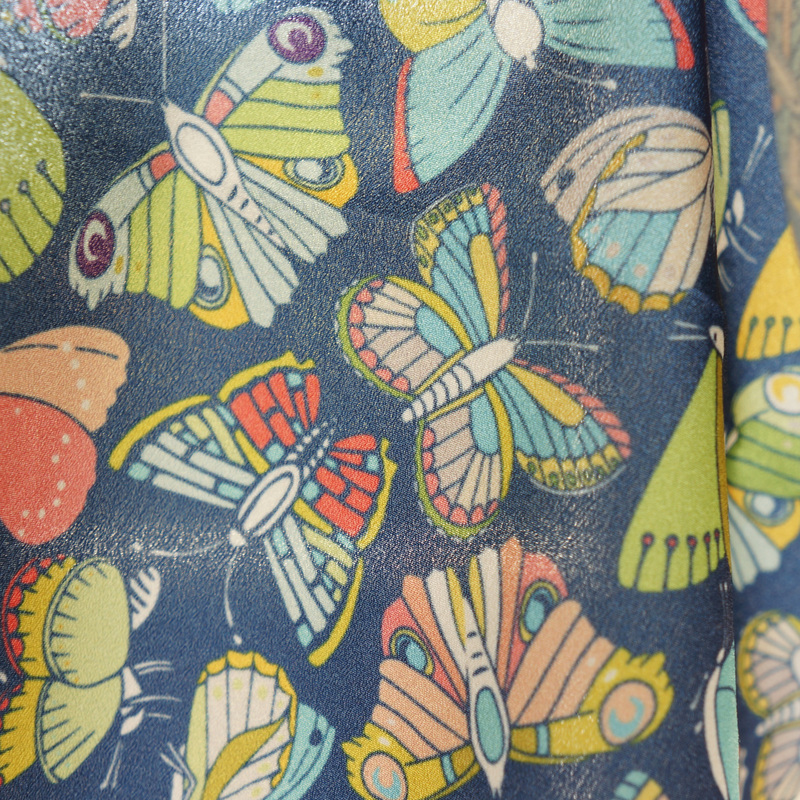 I'm thinking I might need to get proofs of the remaining designs in the collection on poly crepe de chine as well. 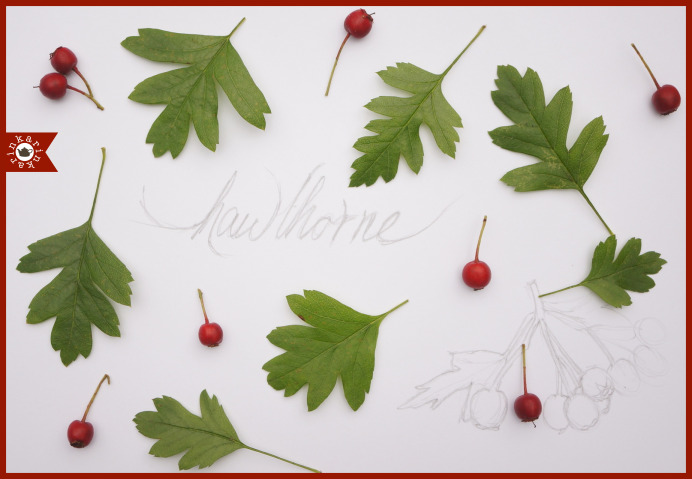 This week I took pictures of leaves and berries. On my walks to and from the park, after lots of rain and with autumn in the air, there were beautiful little bits and pieces of nature on the sidewalk just waiting to be picked up. I love the feeling of tactile pattern design. Arranging physical objects on a white background feels different than moving them around on a computer screen. I've been sharing some of these on instagram. I also continued working on the little bunny illustrations I started a few weeks ago. So far I have 12 illustrations which I've decided to turn into a picture book for my daughter. 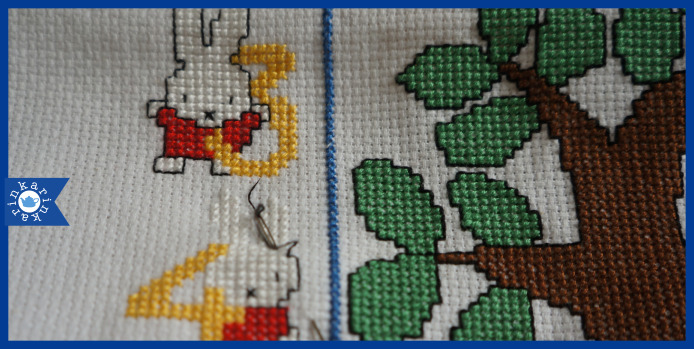 The main character is her bunny Bobo (also featured here on this ballerina bunny fabric). I've started working on the storyline, and realised I probably should have come up with a plot before doing the illustrations! I'm debating making it into a cloth book which I'll sell in my shop. 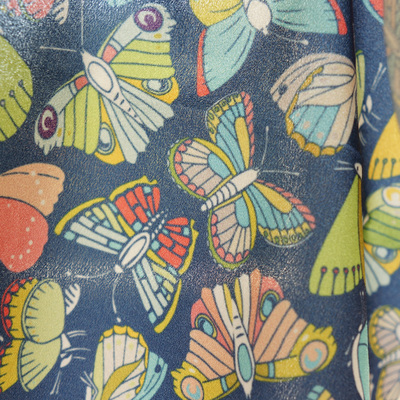 And finally, this fabric swatch arrived in the post this morning. 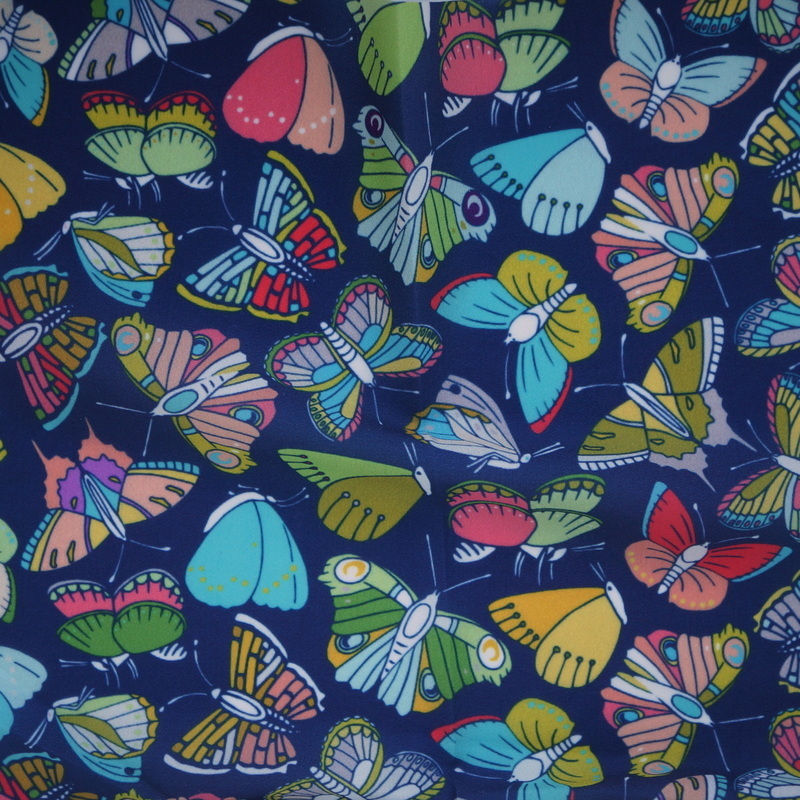 Its my butterflies at night design, and was printed on the new fabric poly crepe de chine. I love it! Its smooth, thin yet sturdy, has a tiny bit of a stretch in one direction and the colours printed beautifully. I'd love to make a scarf or a blouse out of it. Its available for $23/yard. 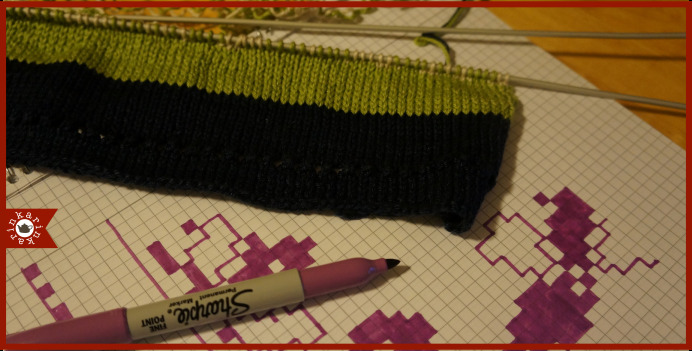 In addition to my blog, this is where I share updates on what I'm working on at the moment.